In direct metal laser sintering, a laser draws onto the surface of atomized powder to build production-quality metal parts. The process produces metal parts with the same speed as plastic parts, and it can transition into metal injection molding. Because DMLS can use most alloys, prototypes can be functional hardware made from the exact same material as the eventual production parts. This technique makes adding internal features and/or passages into the part’s design since it’s created layer by layer. 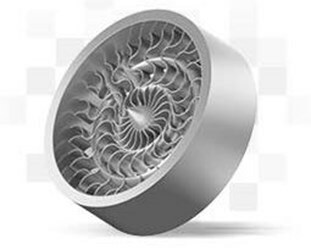 Direct metal laser sintering produces metal parts with the same speed as plastic parts and has the potential to transition into metal injection molding once the need for increased production is identified. Contact Proto Labs for more information on their DMLS process, or their other additive manufacturing capabilities.